Former English Defence League (EDL) leader Tommy Robinson attended a media law training session with London law firm Kingsley Napley, it emerged yesterday. News of Robinson’s attendance at the media skills course came as three judges heard his appeal against a 13-month prison sentence for contempt of court. 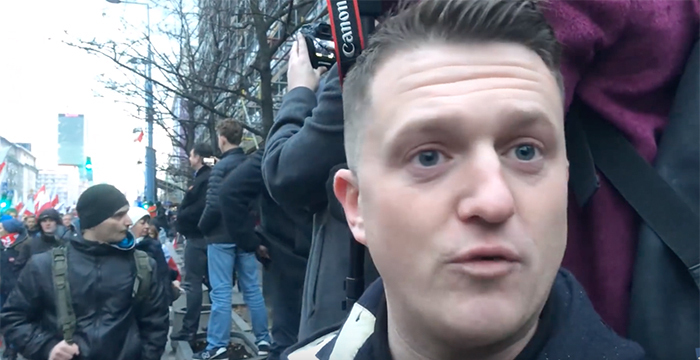 Robinson, who appeared under his real name of Stephen Christopher Yaxley-Lennon, was jailed in May after he filmed outside a criminal trial and broadcast the footage online. The clip was watched about 250,000 times within hours of being posted on social media. The Court of Appeal heard yesterday how Robinson — along with members of the Canadian-based news website, The Rebel Media — attended a “rigorous” media law training session hosted by Kingsley Napley. The session, which is understood to have taken place in June 2017, was brought to the court’s attention by Robinson’s barrister, 25 Bedford Row’s Jeremy Dein QC. Dein refers to a legal seminar that we at @therebeltv set up for Tommy at a leading law firm, Kingsley Napley, where Tommy was given a deep briefing on how to stay on the right side of the law. Dein mentions this as an indication of Tommy’s good faith conduct. Kingsley Napley didn’t respond to Legal Cheek’s requests for comment. Elsewhere during the hearing, Dein QC urged the Lord Chief Justice Lord Burnett and two other judges to release Robinson, submitting that procedural “deficiencies” had given rise to “prejudice”. He further argued that Robinson’s 13-month sentence was “manifestly excessive” and claimed “insufficient weight” had been given to personal mitigation. Reserving judgment, Burnett said that the court would do its “level best” to give a decision before the end of the month. The post Tommy Robinson attended media law ‘training session’ at Kingsley Napley appeared first on Legal Cheek.